You'll be led step by step through the process of building a robot that uses the power of a Linux based computer paired with the simplicity of Arduino. 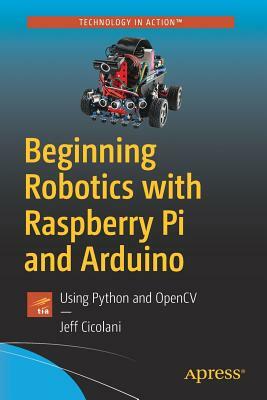 You'll learn why the Raspberry Pi is a great choice for a robotics platform; its strengths as well as its shortcomings; how to overcome these limitations by implementing an Arduino; and the basics of the Python programming language as well as some of the more powerful features. With the Raspberry Pi you can give your project the power of a Linux computer, while Arduino makes interacting with sensors and motors very easy. These two boards are complimentary in their functions; where one falters the other performs admirably. The book also includes references to other great works to help further your growth in the exciting, and now accessible, field of smart robotics. As a bonus, the final chapter of the book demonstrates the real power of the Raspberry Pi by implementing a basic vision system. Using OpenCV and a standard USB web cam, you will build a robot that can chase a ball. Hobbyists and students looking for a rapid start in robotics. It assumes no technical background. Readers are guided to pursue the areas that interest them in more detail as they learn.